Thank you very much for the course last week. It was extremely useful and helped me to realise where is more safe to ski and good to learn how to use transceivers. It was also great to have a ski in a new place. It was a very well run course and I would definitely recommend it to friends. Thanks a lot for the great weekend, I for one learnt loads about mountain safety and thoroughly enjoyed myself. Thanks for a really great few days, I learnt alot which I’m sure will help keep me and others safer in the future! Really great skiing with you and highly impressed with your level of knowledge about mountains. Toby was very effusive about the course. He really enjoyed it and particularly the fact that it was “hands on and practical”. He would love to come back and do some ski touring with you. (He enjoyed strapping his skis to his backpack and walking around the mountain.) 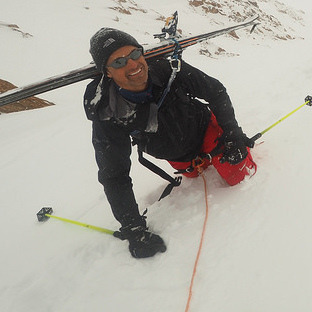 The weekend just fuelled his passion for skiing and being out on the mountains. Having switched from a snowboard to skis to take up touring, Andy put me through a fast-track four-day training plan in preparation for a trip to Greenland. Andy’s training is delivered in a comprehensive and yet understandable fashion and my skiing improved drastically in only a few days under his guidance. I also learned more about safe mountain travel than I had in the previous 30 years. As an added plus, he also has an uncanny ability to smell out good snow! If you are looking to develop your own skills, whilst training in a entirely realistic environment, then I couldn’t recommend Andy highly enough. He’s an excellent tutor. Andy, our trip leader, was outstanding. He is clearly very knowledgable, experienced and I felt very safe with him. When a member of the team was struggling he helped them to get through the day/s and they were able to complete the trip. Andy did a great job of not letting this impact the trip too much whilst ensuring that he gave extra support where needed. Just had a TOP week of climbing in Chamonix with Andy Perkins, it was perfect… the balance of teaching and adventure and stunning rock and scenery couldn’t have been better. Just a quick message of thanks for an excellent week. Not just the guiding, but the organisation, coaching, encouragement and attention to detail was exceptional. It was a great experience for me and has given me the confidence and experience to cope very much better with touring days in future. It looks like this will be put to the test this weekend at La Grave. I may be out in Cham in early April, but look forward to being in touch again with regard to preparation for next year’s skiing activities. Thanks again for a fabulous day climbing at Servoz! As ever, your patience, expert coaching and enthusiasm is amazing, and much appreciated. I still can’t believe you got me to climb to the top of that cliff! I never thought I’d be able to do multi-pitch climbing, so a big thank you. I definitely feel a lot more confident in my rope work now, and can’t wait to get out in the mountains again. It’s easy to write a post about Andy’s truly vast knowledge of conditions, weather, techniques, equipment, geography, terrain, flora, fauna, logistics, history, languages, physics, psychology and human nature — and how all these things combine in the mountains. Or to rattle on about what an even tempered, patient, interesting and delightful person he is. What I was blocking on until just this moment, was how to convey his role in some challenging and transformative passages. I realized I just have to point to the first two sentences. He got us safely in and out and also intact as a family and as a team. We stretched. I took my two darlings (18 and 22 year old son and daughter) on a trip which I hoped would open new windows of view on the world, human experience and their own inner strengths and limitations. We got that plus much more with Andy’s help. He also wrestled gracefully with ridiculously complicated logistics resulting from my wanting to climb and bicycle almost simultaneously. I think the world of Andy and would feel lucky and safe with him on any adventure. I am certainly not exaggerating at all about his extraordinary knowledge. Somewhere along the line he got a PhD in engineering — which seems like a particularly good idea when one is dangling off the end of a line which he has secured. . . . Quite a guy. What an amazing experience we had with him! We met Andy through Richard Mansfield of www.mountain-guides.net Richard also arranged a training day with the incomparable Isabelle Santoire who is also top flight, joyful and awesome. 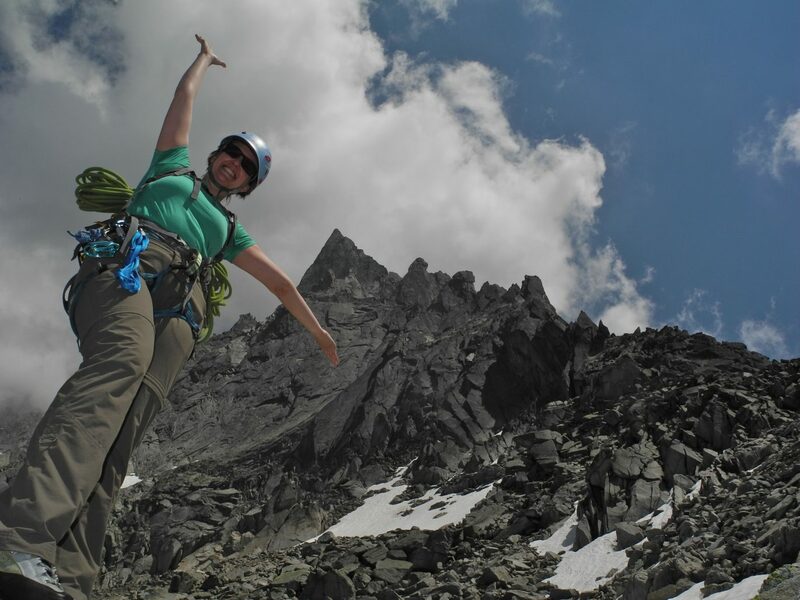 Yay for the gutsy women mountain guides! A very small and elite band. All together our experience was beyond my imaginings. Many, many thanks to Andy for his care, intelligence and patience! 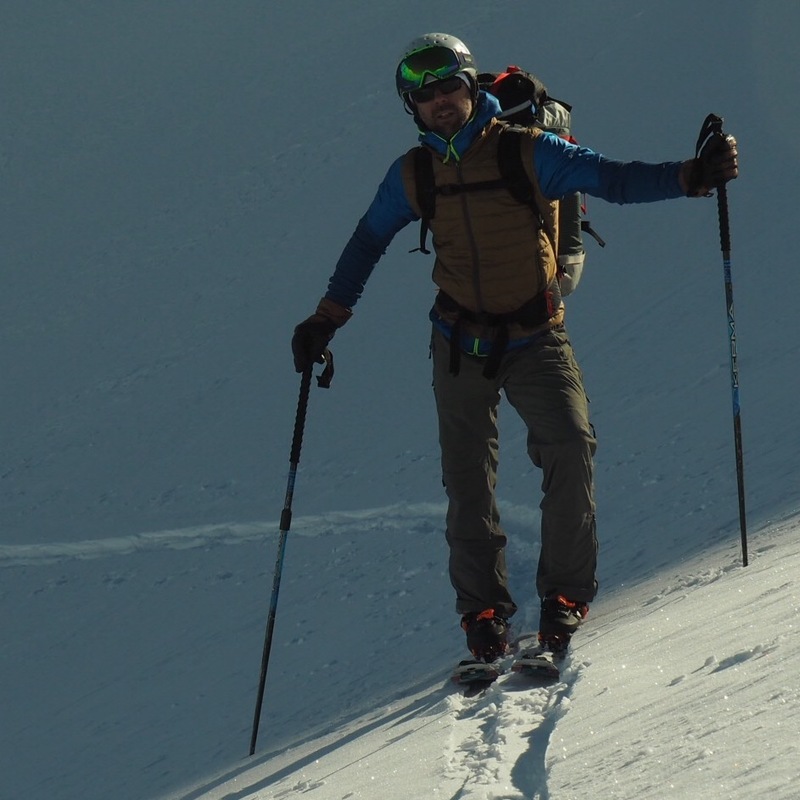 For anyone thinking of utilising a mountain guide – book Andy! 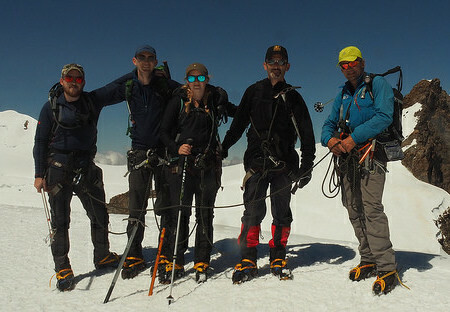 We have just returned from a great 4 days of mixed rock and alpine routes including the Monch and Jungfrau. Having used a number of different guides in the past I can honestly say I feel Andy is by far the best. A great combination of instruction, patience, safety and above all fun! (even if Type 2 sometimes hey Andy). All the best for the coming ski season, and hope to see you again. Totally agree with David. We had a superb time. Really enjoyable (and safe!). I look for mountain wisdom in a guide – someone who you know has that sixth sense that ensures things go well. It only comes from experience and that is exactly what Andy has. Great fun but safe with it. Thank you as always for a fantastic time over the last few days. It was great to get Harry (my godson and nephew) and his friend, Hugo, out for three days with you to get more appreciation and awareness around avalanches. 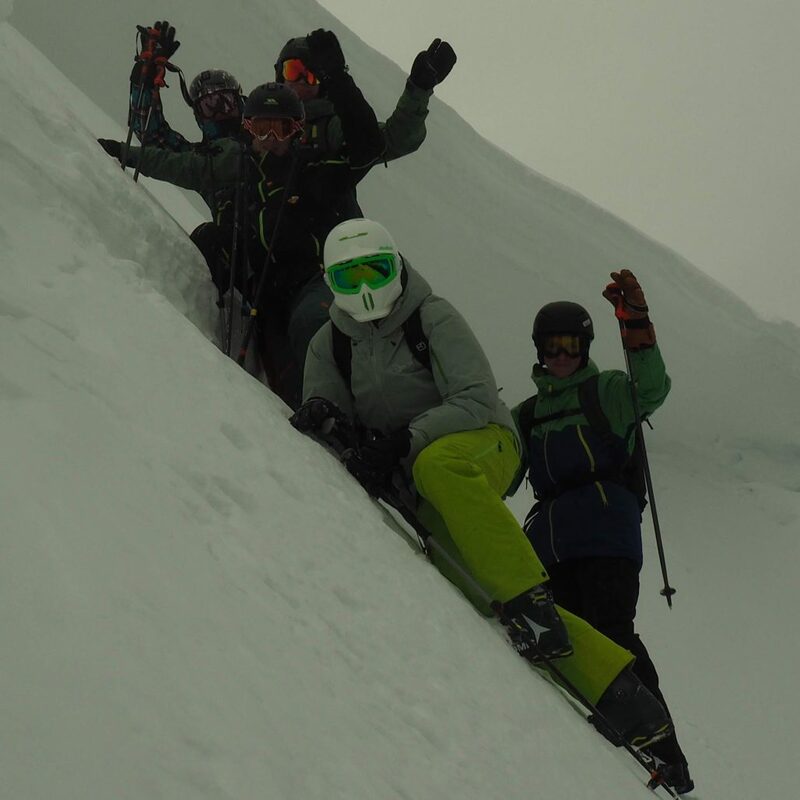 It was wonderfully educational – skiing in La Thuile and Courmayeur in Avalanche category 3 and 4 put it all in practical persepctive with some very fragile snow conditions, course notes, various transceiver exercises and lots of personal examples and slides. Also, seemed a good excuse for you to get your new and very wide Vokl’s out for a trial. We all went away with a stack load more practical information, as well as having skied some great powder amid some spectacular scenery. Thanks as ever and look forward to seeing you in late March for some touring around the Gran Paradiso. Learnt more in one day on & off piste at Argentiere with AP than all my previous lessons. Great teacher. Just had to mention the fantastic week we had in Les Diablerets really challenging conditions. but as always Andy hit the jackpot for us, always ready to change the itinerary to get the very best from the ever changing conditions. we never failed to have freshtracks everyday. As always it is an education to ski with Any Perkins if you haven’t yet… book early to avoid disappointment. I came all the way from British Columbia, Canada. Having done ski touring and a tad taste of mountaineering in my country my sister invited me to come join this crew for a taste of the Alps. I was expecting sharing my days here with lots of people and with the lack of snow, testing my newly sharpened edges on ice. BUT this was not the case. If I had gone on my own, my initial thoughts would have been true, having Andy who knew the area and was able to sniff out terrain like a dog for a bone made me coming to Switzerland worth every penny!! I was exposed to an amazing part of the Alps with sweet stashes of fresh snow, terrain just challenging enough to tease my skills and yet fun enough to keep a smile on my face. I had assurance knowing that every day was going to be safe and full of wonderful surprises. I NEVER would have bagged some of the peaks Andy roped (pun intended) us into doing either. Thanks, Andy, for teaching me how to read terrain better, anticipate avalanche hazard and pick better up-tracks. I didn’t even cry myself to sleep after you took photos of me to help me with my skiing technique. The next day I applied them and what a difference!! I’ll take it home with me to perfect so I can return to show you my improvements. I had an amazing time both on and off the snow and will remember this always. You were my first guide and you showed me there’s a reason to use one! Your experience shows and I much appreciated you sharing it with us. Don Whillans’s quip came home to me when I got the bus back to Geneva airport and talked to a chap who had suffered a badly broken ankle on his way to the Argentiere hut on the first day of his holiday.He also had a guide and that’s where we had gone but…..
Andy has the same attitude and this is what makes him such an excellent guide. He has of course huge experience in all terrains, but it is the ability to judge the client and the conditions and get the best out of the two that makes it such a relaxing pleasure to climb with him. He is firm (no leading or faffing around too much) and fair (you can get to the top on time) and reasonably patient with middle aged people past their prime. Over the four days we did 28 pitches and completed Cocher Cochon, Gaspard 1er and Gateau de riz. With the help of good weather, light winds and good acclimatization in comfortable huts I had a great time with Andy and would recommend him anytime. Thanks Andy see you again! Thank you Andy for knowing where to go for a great day ski touring despite the generally thin and windswept snow conditions. The area above the Great St Bernard Pass was new to me, and the ski touring well suited to my ability. This matching of objective to client and conditions is part of the reason I choose to go guided; plus the education from your communicating your decision making throughout the day (not something in my experience that all guides do); plus the technical instruction which is thoughtful and very clear (again not something all guides achieve); plus of course you brought me back in one piece. A bargain really! Just a quick note to thank you for a fantastic few days ice climbing. Given the so-called ”poor current conditions for ice climbing in the Alps” (quote many Internet sites……….) your ability to find three great routes in terrific nick, in a new area for me, is testament to your mountain craft and knowledge of the Alps. Have a great remainder of the season and see you in the summer !